Scared about cold drafts and high heating bills? Here’s what to do about it. 1. 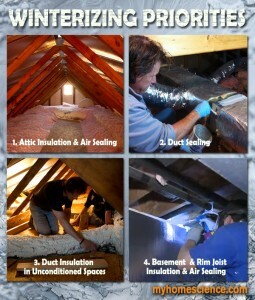 Air-seal the attic & upgrade attic insulation (for possible 40% savings on heating bills). 2. Seal leaks in the ductwork system. 3. Insulate ducts located in unconditioned spaces (attic, crawl space, garage). 4. Air-seal the basement (esp. basement windows & rim joist) to stop cold air infiltration. Cold drafts. Chilly floors. High heating bills. We all have the same worries as winter approaches. But advice on how to avoid these discomforts varies greatly. Depending on who you’re talking to, you might be led to believe that you need a new furnace, new windows, better weatherstripping, or a radiant barrier in the attic. Yes, it’s confusing. But it doesn’t need to be. To help you make smart decisions about winterizing your house, this blog will explain what winterizing improvements are most important and what to do first. First, short-circuit the Stack Effect with key “building envelope” improvements. Before you replace your furnace or pay out a huge sum for replacement windows, it’s smart to short-circuit the Stack Effect by thoroughly sealing leaks between your living space and the attic. There’s good information about attic air sealing right here at myHOMEscience, and at the ENERGY STAR® website. Overhead, a better overcoat. Beefing up attic insulation should be high on any list of winterizing improvements. 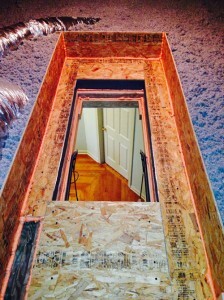 But don’t add extra attic insulation without air-sealing the attic first. If you’re thinking about air-sealing the attic yourself, be warned: It’s a difficult and uncomfortable job. Professional home performance contractors like Dr. Energy Saver know where to look for common air leaks. They can perform a blower door test to actually pinpoint leak locations, then seal leaks with specialized treatments. 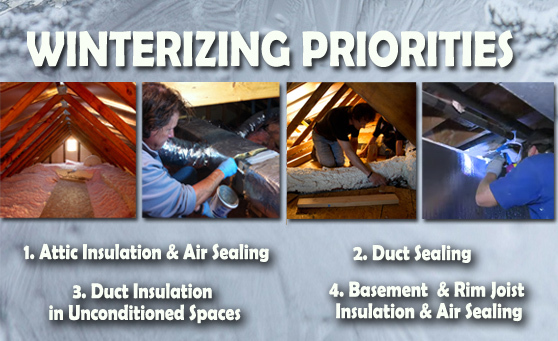 Properly air-sealing an attic and upgrading attic insulation can cut your heating expenses by as much as 40%. In terms of winterizing improvements, these two upgrades almost always have the best return on investment. Another winterizing priority is your ductwork system. You don’t want air that you’ve paid to heat escaping through duct leaks before it gets to your living space. Nor do you want to blow heated air through ice-cold uninsulated ductwork located in an attic or crawl space. Two ductwork improvements (sealing and insulation) will enable your furnace to heat your home more effectively (and thus, more economically). For extra insurance against cold drafts, air-seal around basement windows and around the rim joist that rests atop your foundation. Because these improvements are affordable and effective, they really qualify as no-brainers. OK, it’s possible you might need a new furnace, new windows or a new entry door to help keep out winter chills. But none of these upgrades come close to the building envelope improvements described above in terms of impact on comfort & energy efficiency. What’s more, air-sealing and insulation upgrades last forever and have no upkeep requirements. Let’s finish up with a helpful analogy. It’s freezing outside and you’re wearing a t-shirt and jeans. Do you want to keep warm by running in place, or by putting on a nice down jacket? You got it. Take care of your building envelope first.